Traumatic brain injury (TBI) has recently become a serious societal concern, as the link between repetitive head traumas and neurodegenerative brain disease has come to light. Yet TBI is signficantly under-reported due to lack of adequate diagnostic tools, sparking great debate about this ‘silent epidemic,’ particularly among professional and youth sports programs. Early detection tests are desperately needed to minimize exposure to repetitive mild brain traumas, and its long-term consequences. “Mild TBI often goes undiagnosed due to delayed symptom onset and limited sensitivity of conventional assessment measures,” said Daria LaRocca, Ph.D., a professor in the Department of Microbiology and Immunology, SUNY Upstate Medical University and lead author of a study published in PLOS One in January. LaRocca’s research team offers new hope with the discovery for biomarker signatures that may easily detect TBI with a simple, non-invasive blood or saliva test. These biomarkers could vastly improve diagnostic options, and also point to underlying molecular pathways to target for new TBI treatments and prevention. Blood and saliva carry miRNA messages that originate in the brain, noted La Rocca. These messages give researchers a unique opportunity to ‘see’ molecular processes at work in brain, to detect injury remotely and non-invasively. “MiRNA profiles serve as a proxy of pathological processes occurring in the central nervous system,” she said. LaRocca’s team examined miRNA messages in blood and saliva of 50 mixed martial art fighters, at various times before and after a fight. Looking also at established measures of TBI, including number of head impacts and tests of cognitive function, memory, balance, motor skills, and serum protein biomarkers, their analysis revealed correlations between specific miRNA biomarkers and cognitive deficits. “Some miRNAs show associations with the quantity of head impacts… and measures of balance and cognitive function,” said LaRocca. Overall, the team discovered two distinct biomarker signatures that predict TBI with 90% accuracy—a higher rate than current FDA-approved blood tests. Interestingly, these signatures appear in blood and saliva at different times, highlighting the importance of timing in researching and implementing biomarker-based tests. The saliva-based signature includes 12 miRNA that appear immediately after injury, subsiding within 2-3 days. Meanwhile, the blood-based signature has a delayed onset, comprising 13 different miRNAs that peak a week later. The saliva-based signature in particular offers a promising tool to diagnose athletes on-site, to prevent further exposure to repetitive TBI. These miRNA biomarkers also paint a molecular picture of how trauma to the brain causes temporary and permanent cognitive impairment, mental problems and neurodegenerative disease. Some miRNAs disrupt molecular pathways and genes critical to brain function. These include neural development, axon guidance and synapse formation pathways which orchestrate neural communication and plasticity. Their disruption may explain TBI-induced confusion, as well as learning and memory deficits. 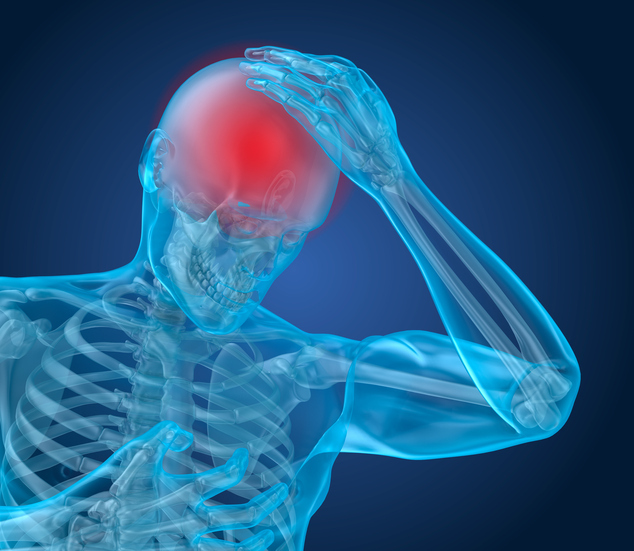 Other biomarkers reveal inflammation in the brain in response to injury. Such neuroinflammation is characteristic of various mental disorders and neurodegenerative diseases that are linked to TBI. In fact, many of these TBI biomarkers are also biomarkers of Parkinson’s disease, multiple sclerosis, Alzheimer’s, depression, and drug addiction, pointing to common disease mechanisms and a possible explanation for their associations with TBI. The findings suggest that initial neuroinflammations sets in motion pathological processes that further damage the brain and ultimately lead to this constellation of diseases. “Repetitive mild TBI is associated with serious long-term sequelae like chronic traumatic encephalopathy, leading to cognitive impairment, neuropsychiatric symptoms, dementia and pugilistic parkinsonism,” said LaRocca. These insights provide researchers with new molecular targets for treating TBI. Drugs aimed against these pathological pathways could potentially prevent or minimize both short and long-term cognitive impairment after TBI. Such advances could also prove fruitful against a multitude of neuroinflammatory and neurodegenerative diseases with common underlying etiologies.